I would like to begin by greeting you kindly. I recognize that you have come here out of your sincere interest in and wish to practice the genuine Dharma and out of your respect for the teachings. And this is all delightful to me, and I thank you for it. I consider myself fortunate to have such an opportunity to form such a wonderful connection with you. To begin, I would like to recite a traditional supplication to the teachers of my Lineage, and while doing so, I invite you to join me in an attitude of confidence and devotion. The essence of the Buddhadharma, the teachings of the Buddha, is practice. And when we say “practice,” we mean the practice of meditation, which can consist of either the meditation known as “tranquillity” or that known as “insight.” The reason we practice meditation is to attain happiness, and this means states of happiness in both the short term and the long term. With regard to short-term happiness, when we speak of happiness, we usually mean physical and/or mental pleasure. But if you look at either of these pleasant experiences, the root of both is a mind that is at peace, a mind that is free of suffering. Because as long as one’s mind is unhappy and without any kind of tranquillity or peace, then no matter how much physical pleasure one experiences, it will not take the form of happiness as such. On the other hand, even if one lacks the utmost ideal of physical comfort, wealth, and so on, if one’s mind is at peace, one will be happy anyway. We practice meditation in part in order to obtain the short-term benefit of a state of mental happiness and peace. Now, the reason why meditation helps with this is that normally one has a great deal of thoughts or many different kinds of thoughts run through one’s mind. Some of these thoughts are pleasant, even delightful. Some of them, however, are unpleasant, agitating, and troublesome. Now, if from time to time one examines the thoughts that are present in one’s mind, one will see that the pleasant thoughts are comparatively few and the unpleasant thoughts are many, which means that as long as one’s mind is ruled or controlled by the thoughts that pass through it, one will be quite unhappy. In order to gain control over this process, one begins with the meditation practice of tranquillity, which produces a basic state of stillness and contentment within a practitioner’s mind. An example of this is the great Tibetan yogi Jetsün Milarepa, who lived in utmost austerity. He lived in solitude, in caves and isolated mountains. He was very poor and his clothes were quite shabby. His food was neither rich nor tasty. In fact, he lived only on nettle soup for many years and as a result became very thin, almost emaciated. Now, if one considers his external circumstances, the isolation and poverty in which he lived, one would think that he must have been miserable. And yet, as evident from the many songs he composed, because his mind was fundamentally at peace, his experience was one of constant delight. His songs express his utmost state of rapture and joy. He saw every place he went to - no matter how isolated and uninhabitable - as beautiful, and he experienced his life of utmost austerity as extremely pleasant. In fact, the short-term benefits of meditation are more than merely peace of mind, because one’s physical health as well depends to a great extent upon one’s state of mind. And therefore, if one cultivates this state of mental contentment and peace, then one will tend not to become ill and one will also tend to recover easily if and when one does get sick. The reason for this is that one of the main conditions that bring about illnesses is mental agitation, which produces a corresponding agitation or disturbance of the channels and energies within the body. These generate new sicknesses, ones not yet experienced, and also prevent the healing of old sicknesses. This agitation of the channels and winds or energies also obstructs the benefit that could be derived from medical treatment. If one practices meditation, then as one’s mind settles down, the energies moving through the channels function correctly; as a result one tends not to become ill and one will be able to recover from any illnesses one already has more easily. And we can see an illustration of this also in the life of Jetsün Milarepa, who engaged in the utmost austerities with regard to where he lived, the clothes he wore, the food he ate, and so on. And yet, this did not harm his health, because he did have a very long life, was extremely vigorous and youthful until the end of his life, which indicates the fact that through the correct practice of meditation, the mental peace and contentment that is generated calms down or corrects the functioning of the channels and energies, allowing for the healing and prevention of sicknesses. The ultimate or long-term benefit of meditation practice is becoming free of all suffering, which means no longer having to experience the suffering of birth, ageing, sickness, and death. Now, attainment of freedom from suffering is called “Buddhahood,” and in the specific terminology of the Vajrayana it is called “supreme attainment or supreme siddhi.” In any case, the root or basic cause of the attainment of Buddhahood is the practice of meditation. The reason for this is, again, that generally one has a lot of thoughts running through one’s mind, some of which are beneficial (thoughts of love, compassion, rejoicing in the happiness of others, and so on) and many of which are negative (thoughts of attachment, aversion, jealousy, competitiveness, and so on). Now, there are comparatively few of the former types of thoughts and comparatively many of the latter types, because one has such strong habits that one has accumulated within oneself over a period of time that is without beginning. And it's only by removing these habits of negativity that one can free oneself from suffering. One cannot simply remove “mental afflictions,” kleshas, by saying to oneself, "I will not generate any more mental afflictions," because one does not have the necessary freedom of mind or control over the kleshas to do so. In order to relinquish them, it is necessary to actually attain freedom, which begins with the cultivation of tranquillity. Now, when one begins to practice the basic meditation of tranquillity, one may find that one’s mind won't stay still for a moment. But this is not permanent. It will change as one practices, and one will eventually be able to place one’s mind in stillness at will, at which point one has successfully alleviated the manifest disturbance of the kleshas. On the basis of stillness and ease, then one can apply the second technique, called “insight,” which consists of learning to recognize and directly experience the nature of one’s own mind. This nature is referred to as “emptiness.” When one recognizes this nature and rests in it, then all of the kleshas that arise will dissolve into emptiness and are no longer afflictions. Therefore, freedom, which is called “Buddhahood,” depends upon the eradication of the mental afflictions, and that depends upon the practice of meditation. The practices of tranquillity and insight are the general path that is common to both Sutrayana and Tantrayana. In the specific context of Vajrayana, the main techniques are called “the generation and the completion stages.” These two techniques are extremely powerful and effective. Generation stage refers to the visualization of, for example, the form of a Lineage Guru, or the form of a “deity,” yidam, or the form of a Dharma Protector. When first encountering this technique, it's not unusual for beginners to think, “What is the point of this?” As it is, one supports and confirms one’s ignorance and one’s kleshas through the constant generation of impure projections or impure appearances that determine one’s experience of samsara. In order to transcend this painful process, one needs to transcend one’s impure perceptions together with the suffering that they bring on. A very effective way to do this is to replace these impure and distorted projections with pure projections that are based on the meaning of a yidam, Dharmapala, and so on. By starting to experience the world as the mandala, “the pure environment of the deity and all beings as the manifestation of that deity,” then one will gradually train oneself to overcome one’s mental afflictions and to create the pure environment for the natural manifestation of one’s own innate wisdom. Overcoming and eradicating afflictive states that conceal the true nature of one’s own mind and establishing the pure mandala occur gradually through the creation stage of practice. The deities used in meditation practice vary in appearance. Some of them are peaceful and some of them are wrathful. In general, the iconography of the wrathful deities points to the innate power of wisdom and that of the peaceful deities to the qualities of loving-kindness and compassion. Also, there are male deities and female deities. The male deities represent the method, which is compassion, and the female deities represent intelligence and wisdom. For these reasons, it is appropriate to engage in the practices of meditation upon deities. 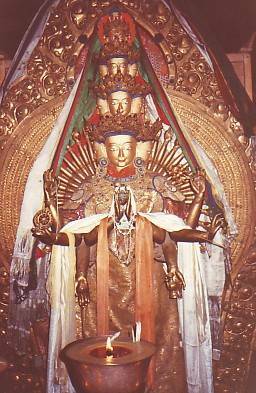 And because these practices are so prevalent in our tradition, if one goes into a Vajrayana meditation hall or temple, one will see lots of images of deities - peaceful deities, wrathful deities, and extraordinarily wrathful deities. And one will see lots of shrines with some very eccentric offerings on them. If not accustomed to this, one might think, "What is all this?" One might feel, "Well, the basic practices of tranquillity and insight make a lot of sense and are very interesting, but all these deities, all these rituals, and all these music instruments make no sense." However, each and every depiction in the iconography and each and every implement one finds in a shrine room are there for very specific reasons. The general reason is that one needs to train oneself to replace one’s everyday apprehensions of impurity or negativity with those that are pure. And it is impossible to simply fake it - one can't simply talk oneself into this practice, because the purpose of practice is learning to place something that is deeper than a concept - it's more like a feeling. Therefore, in Vajrayana practice, a great deal of the energy of purity is generated, and in order to generate it, practitioners use physical representations, offerings, musical instruments, and so on - they inspire and manifest the experience of purity. In short, all sacred depictions and implements are useful in that they enable a practitioner to experience and become accustomed to his and her indwelling pure nature. This concerns the first of the two techniques of Vajrayana practice, the generation stage. “It does not exist and has not even been seen by the Victors. It is not non-existent; it is the basis of all samsara and nirvana. This is not contradictory, but is the Great Middle Way. “It does not exist, it has not even been seen by the Victors. It is not contradictory, but is the Great Middle Way. In other words, both traditions teach how to recognize and realize the very same nature. So short-term and long-term happiness depend on the diligent cultivation of meditation. According to the Sutrayana Tradition, the foundation for all Buddhist schools, long-term happiness is established by meditating tranquillity and insight. According to the exceptional Vajrayana Tradition, ultimate happiness that is bliss is attained by practicing the generation and completion stages of meditation. Meditation actually depends upon the generation of loving-kindness and compassion. And this applies for any meditation practice, but it is especially relevant for Vajrayana practitioners. The reason is that the specific visualization of deities and meditation upon Mahamudra are based upon the pure motivation on the part of the practitioner from the very start. If the genuine motivation is missing (and it is quite possible that it might be missing since we are ordinary people) then not much benefit will really have been won from practicing. For that reason, Vajrayana disciples always try to train their motivation – they always try to develop and increase the pure motivation that is known as Bodhictta, “the awakened mind.” If one looks at the liturgies used in Vajrayana practice, one will see that the long and extensive forms as well as the very short versions always begin with meditation upon Bodhicitta, “loving kindness and compassion.” This meditation is necessary for all meditation practices, but it is especially a prerequisite for Vajrayana disciples to reflect and meditate again and again. The only real meaning and purpose that can be seen for being born on earth as a human being is to help living beings become free from suffering and attain lasting happiness and joy. If one spends one’s life hurting and harming others, then one’s life will certainly have been more than meaningless. If a sincere and dedicated practitioner fully acknowledges that the only purpose of having been born is to benefit others as much as possible, then he and she understands that the basis for their aspiration is developing and increasing Bodhictta. The main cause for having the firm and decisive motivation of Bodhicitta is loving kindness and compassion for others. How does one practice? When one recognizes that one feels contempt or is mean towards others, it is crucial to be aware of those feelings and to let go of them. Even though one may not have such negative emotions, nevertheless, one may still only be thinking of oneself while hoping to improve one’s own situation at the expense of others. If that is the case, then it is necessary to reflect that being indifferent about others’ suffering and needs is rather limited and petty. One needs to expand one’s feelings of care and concern for others in order to lead a meaningful life, so generating and increasing Bodhicitta is certainly a very important and beneficial practice. Love and compassion are not restricted to Buddhists or only practiced in Buddhism. Everyone in the world has always been, is, and will be concerned about love and compassion. There is no one who says that love and compassion are bad and one should try to get rid of them. However, Buddhism offers exceptional methods to develop and increase one’s love and compassion. In general, when speaking about compassion, one thinks of natural or spontaneous sympathy and empathy for somebody who suffers. Compassion is generally associated with suffering and sorrow. It intensifies if one realizes that one cannot do anything to help. In the absence of compassion for someone in need, only one person suffers. When compassion is present in somebody else, then two people feel miserable – this happens. The method to develop and increase one’s compassion according to the Buddha is a little different. Although one knows that one cannot really help immediately, compassion in Buddhism means giving rise to the basis for somebody’s ultimate happiness. In this case, one is confident that it will be possible to remove their misery and that they will be free one day. Experiencing compassion in this manner does not engender misery, rather delight in the heart of a practitioner. In Vajrayana we speak of the Four Immeasurables. The term “immeasurable” in this context means “impartiality.” Compassion that is immeasurable means not helping or benefiting one person or living being at the expense of another. Immeasurable compassion is feeling equally for all living beings. The basis for having immeasurable compassion is realizing that all living beings without exception want to be happy and do not want to suffer. There is no being anywhere who wants to suffer. And if one seriously understands this, then one will give rise to the very sincere wish that all living beings be free from suffering. There is also no being anywhere who does not want to be happy. And if one seriously understands this, then one will give rise to the very sincere wish that all living beings are happy. Realizing that suffering and happiness depend upon causes, one also wishes that every living being be free of the causes of suffering and attain the causes of happiness in their lives. We saw that the kleshas cause suffering - ignorance, attachment, aversion, jealousy, arrogance, and so on - and that it is because of the mental afflictions that one suffers. By appreciating that it is possible to overcome and transcend the kleshas, one knows that by engaging in meditation practice it is possible to eradicate the causes of suffering for oneself and others. One should not expect immediate results, though, but it is definite that one will eliminate suffering if one has confidence and practices correctly and diligently. It is just this unwavering confidence that gives rise to the wish that others be happy and free from suffering. Having cultivated impartiality and feeling immeasurable equanimity for all living beings as a result, one’s love and compassion also become immeasurable. Immeasurable love and immeasurable compassion enable one to experience immeasurable joy, because one has confidence that one can help others truly become free and experience lasting happiness. Immeasurable love is the wish that all living beings have happiness and its causes. Immeasurable compassion is the wish that all living beings be free of suffering and its causes. Confidence and trust that it is possible to one day truly help all living beings become free of suffering and attain lasting happiness engenders immeasurable joy in the mind of a practitioner. Since these qualities are immeasurable, they are not bound or restricted. Usually one’s positive attitude is restricted to loved ones and friends, so it is necessary to develop and increase one’s impartiality, i.e., equanimity, by realizing that all living beings wish to be free of suffering and to experience happiness and joy. By practicing in this way, one can increase one’s loving kindness and compassion for all living beings without exception. This has been a brief introduction to the purpose of practicing meditation – how to train and generate compassion. If you have any questions, please feel free to ask. Question: Rinpoche, can you speak a little bit about the difference between pure projections and impure projections, and, in particular, where do pure projections actually come from? Rinpoche: First of all, impure projections are the way one experiences and apprehends the phenomenal world based upon one’s kleshas. Because one has kleshas, one experiences and differentiates friends and enemies, likes and dislikes, which bring on attachment and aversion. Experiencing life based on the kleshas, one’s apprehensions are not free but tainted, i.e., distorted and deluded. What is referred to as “pure vision” is an apprehension of all appearances and experiences that is based upon the authentic realization of mind’s true and pure nature. As long as one is deluded by one or a few of the kleshas, one experiences everything in a state of confusion. The true and actual nature of the kleshas is described as the five wisdoms. When one lets go of clinging to a self and gives up being preoccupied with oneself, then everything is experienced impartially - this realization is called “wisdom of equanimity.” When one recognizes the true nature of all appearances and experiences, then this realization permeates one’s entire being - this realization is called “Dharmadhatu wisdom,” and so on. Now, when a very advanced practitioner has realized the five wisdoms in the place of the five kleshas, he or she doesn’t apprehend in reliance upon the negative force of the kleshas. Rather, a Bodhisattva experiences purely and manifests the five wisdoms of a Buddha residing in a respective Buddha field. In order to attain such a high level of perception and cognition, one meditates on the form, realm, palaces, and retinue of one of the five principal Buddhas, for example. By meditating the true nature and visualizing a deity clearly during practice, one transforms one’s usual way of experiencing and apprehending the world and beings. Next question: In practicing compassion, there's the practice of tonglen, which is “the sending and receiving,” taking the suffering from all sentient beings and giving them the happiness and merit that we have. In this practice (I've practiced it before) it seems to go well for a while, but then there's a subtle sense of "I" that creeps in and says, "I don't really want to take the suffering" or "I can't deal with too many people having cancer. I just can't take it all on myself." And so one kind of loses a little courage in the practice. Could you illuminate us on this practice and how to overcome these obstacles and really develop the heroic mind? Rinpoche: What you say is very true, especially in the beginning of undertaking this practice. And, in fact, it is okay to experience it that way. Even though in the beginning there is a quality of faking the degree of others’ suffering you really are prepared and ready to take on, there's still benefit in doing this practice, because up until you begin this practice you've probably been very, very selfish. To even attempt to fake altruism is a tremendous improvement. But it doesn't stay insincere, because eventually the habit starts to deepen and begins to counteract selfishness. If you began practicing tonglen when you were already concerned about the welfare of others 100% and not self-centered, then you wouldn't need to practice tonglen in the first place. It is meant for beginners who are still very selfish - the practice leads them to care about others. By practicing tonglen, you cultivate the sincere wish to take the suffering of others upon yourself - you cultivate real love and compassion for others by engaging in tonglen practice. On the other hand, you don't do the practice in order to really take on the suffering of others and experience it yourself. You are engaging in this practice in order to train your mind. And by training your mind, by developing the motivation and increasing the wish to actually free others from suffering, then the long-term result is that you will be able to one day dispel the suffering of others with ease. Next question: Rinpoche, you said that one person may not be able to directly affect or remove short-term unhappiness or suffering of another person, but that we can learn to generate the basis of another's happiness, ultimate happiness. Would you please say more about how one person could generate the basis of ultimate happiness for another person? Rinpoche: Well, the direct basis of establishing another being in a state of freedom from suffering or happiness (i.e., long-term, ultimate happiness) is being able to show them how to get rid of their mental afflictions and to teach them how to recognize and therefore abandon the causes of suffering. Through doing so, then you can gradually establish them in ultimate happiness. But even if this is not possible at the present for whatever reason, by having the intention to benefit others, then when you yourself have become fully free you will be able to gradually free and protect them as well. Next question: Rinpoche, can you say a little more about the practice of letting go when the mind is agitated, as you described and as used in Mahamudra and Dzogchen? I experience my mind when I sit as being agitated. And there's the practice of letting go. I'm wondering if you would just say more about that in a practical way? Rinpoche: In general, the main approach that is taken in the Mahamudra and Dzogchen Traditions is applied when you are looking at the nature of your mind. Now, kleshas are thoughts, and thoughts are the natural display of the mind. Thoughts may be pleasant, neutral, or unpleasant, they may be positive or negative, but in any case, whatever type of thought arises, you deal with it in exactly the same way. You simply look directly at it. Now, looking at a thought, or looking into a thought, or looking at the nature of a thought is quite different from analysing it. You don't attempt to analyse a thought nor do you try to think about that thought. You just simply look directly at it. And when you look directly at a thought, you don't find anything. Now, you may think that you don't find anything because you don't know how to look or you don't know where to look, but, in fact, that's not the reason. According to the Buddha, the reason you cannot find a thought is that thoughts are empty of an own existence. And this is the basic meaning of all the various teachings on emptiness that Lord Buddha presented, such as the teachings on the sixteen kinds of emptiness and so on. Using anger as an example, if you become angry and look directly at your anger - which doesn't mean analysing the contents of the thoughts of anger, but looking directly at that specific thought of anger - then you won't find anything. In the very moment of not finding anything, the negative and harmful impact of anger will vanish along with anger. Your mind will relax and you will be free of anger, at least to some extent. great interest in the Dharma, for listening attentively, and for asking questions. Thank you very much. Photo of H.H. the Karmapa, H.H. 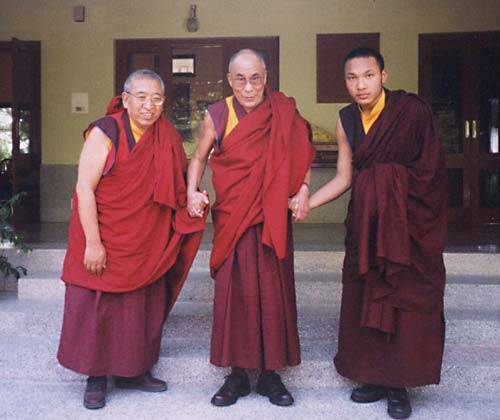 the Dalai Lama and Rinpoche courtesy of the Kagyu Office of the Gyalwa Karmapa. 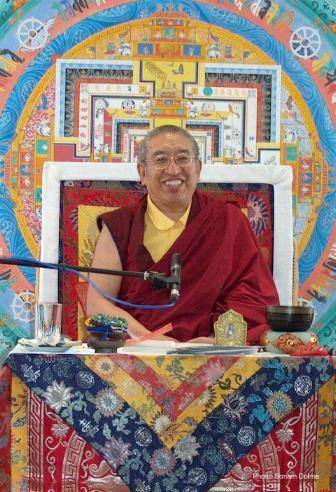 Photo of Venerable Thrangu Rinpoche courtesy of Katrin Weller from Stuttgart. Instructions presented at Karma Shenpen Ösel Chöling in Seattle edited and arranged for Karma Lekshey Ling Institute with sincere gratitude to Most Venerable Khenpo Karma Namgyal by gh.